AutoForm Engineering GmbH is pleased to announce the availability of AutoForm^Plus R6.0.2. This patch has been developed in order to enable AutoForm^Plus Stand-alone R6 to read new license files and is a cumulated patch, i.e. it contains all changes and fixes that have been introduced with the AutoForm^Plus R6.0.1. AutoForm^Plus R6.0.2 is the second released patch version of AutoForm^Plus R6 and is available for download from February 18, 2019. Since soon license files based on the AutoForm^Plus Stand-alone R6 licensing model are not going to be available anymore and AutoForm^Plus R6.0.1 is not capable to read new license filesbased on the new licensing model introduced with the release of AutoForm Forming R8, the AutoForm^Plus R6.0.2 patch has been developed in order to enable AutoForm^Plus Stand-alone R6 to read those new license files.There are no changes in AutoForm-Solverplusin relation to the previous patch version which means that simulationresults are identical to those of AutoForm^Plus R6.0.1! AutoForm^Plus R6.0.2 is a cumulated patch, i.e. it contains all changes and fixes that have been introduced with the AutoForm^Plus R6.0.1. The compatibility of data files between AutoForm^Plus R6 and AutoForm^Plus R6.0.2 is bi-directional, meaning that data files created with AutoForm^Plus R6.0.2 can be processed in AutoForm^Plus R6 and vice versa. About AutoForm^Plus R6. AutoForm Eng. GmbH has introduced AutoFormplus R6 sheet metal forming software. This release offers a new set of functionalities to support users along the digital sheet metal process chain. New options are included for draw bead modeling, blank definition, enhanced springback compensation, systematic process improvement, and hemming. The software also features draw bead reduction strategy, used in combination with the adaptive line bead. This capability offers users a realistic model when determining and optimizing the draw beads. The reduction strategy defines the order, the measures, and the ranges in which a draw bead shape is modified, such as bead height, bead radius, or groove radius. In this model, all of the defined measures are combined and made available to the user through one single parameter. Instead of dealing with all kinds of measures and geometries, the user can focus on this single parameter, which allows for efficient process engineering, even when complex parts are analyzed. About AutoForm Engineering GmbH. 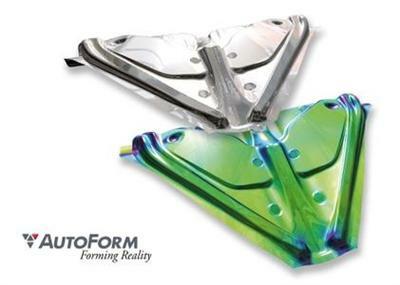 AutoForm Engineering GmbH provides software solutions for the die-making and sheet metal forming simulations. The company offers solutions for product development, planning and bidding, tooling, and tryout and part production. It offers AutoForm products for engineering sheet metal parts; process planning; simulation setup and results evaluation; sensitivity analysis, optimization, and robustness; rapid die face generation during process engineering; planning of hemming processes; geometry compensation of tool; estimation of tooling costs early in planning and bidding; optimal wear protection; simulation of stamping processes; automatic determination of optimum trim line and blank outline; and simulation of hot forming and quenching processes.